February already and we’re approaching Valentine’s day! In fact our latest Cupcake Inspiration Challenge will end right around Valentine’s, and the theme is perfect for it. The theme we have for our fortnightly challenge is Be Mine. As always our challenge theme is open to your interpretation, and we can’t wait to see how you approach it. Our sponsor this time is The Paper Shelter who kindly provided this cute Pepe L’Souris In Love image for the Design Team to play with, and are also offering a prize to one lucky participant. I didn’t make a video for this week’s card because it really was very straightforward. Most of the process was the colouring, and as I did that on my break at work I couldn’t really record it! I do hope to create a video for my reminder post next week though, so stay tuned for that one! I began my card by printing the Pepe L’Souris In Love digi onto a piece of Neenah Solar White 80lb paper. I then used Spectrum Noir Illustrator markers to colour the image in. I went with greys for the mouse himself, and added a touch of pink to the inner ears and nose. I also added a touch of very light blue to give the eyes some dimension, and ivory on the teeth. I used the pinks again on the flowers, and the ivory shades on the wrap for the bouquet. I went with a yellow green for the leaves and stem, and used similar yellow greens on the bow on the cheese. The cheese itself I of course coloured yellow, and used the same yellows for the centres of the flowers. As I type this I realise I didn’t add any shadow to ground the image, but never mind! Having completed the colouring I worked on the rest of the card. I trimmed the coloured panel down so that I could have a reveal around it. I then cut down a yellow mat to just slightly larger than my focal panel, but still smaller than my card base. I cut away the centre of the yellow panel to reserve for future use. This reduces waste and also helps to reduce the weight of the card. Before adhering everything together I added my sentiment. I chose one from Simon Says Stamp’s Beautiful Day stamp set and stamped it with Altenew Jet Black ink. I then added adhesive to the back of my focal panel and adhered it to the yellow panel, before adhering them both to the white card base. 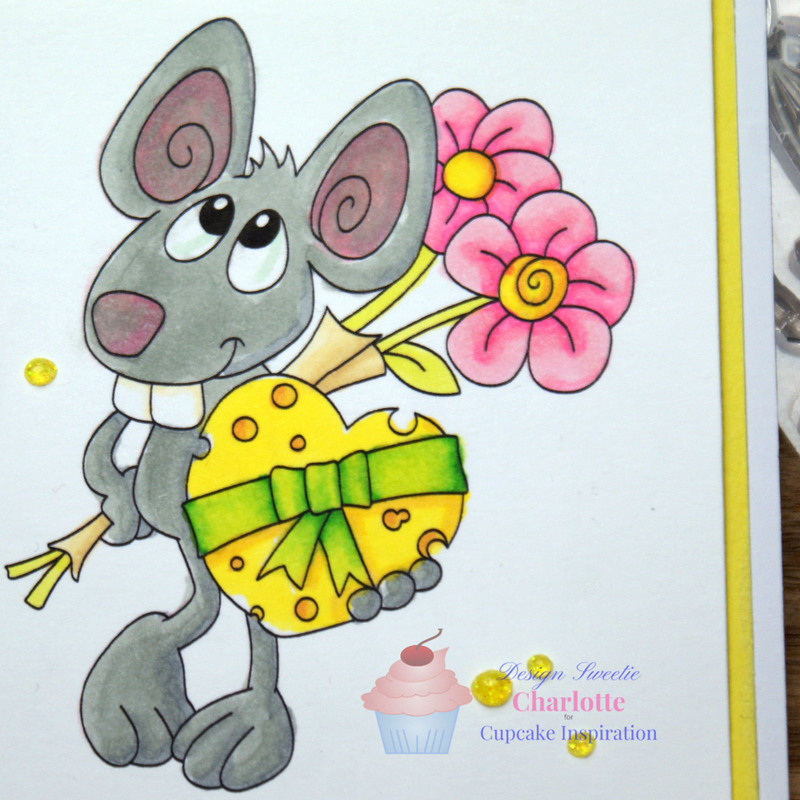 As a final touch I bought in some Yellow Bird Glitter Nuvo Drops and added a scattering of them across the card. I’ll be honest, I’m not overly happy with the colouring on this one. My selection of greys is not the best and the mouse ended up darker than I’d like and with less contrast than I’d prefer. Nonetheless I’m quite pleased with the card as a whole. I think the design works well, and the yellow mat and Nuvo Drops help to pull the card together. An really cute creation, thanks so much for joining in with our ‘Love’ theme at Allsorts this week. I LOVE the addition of the glitter Nuvo drops! Oh my, how sweet it is! Thank you for sharing your card with ATSM! 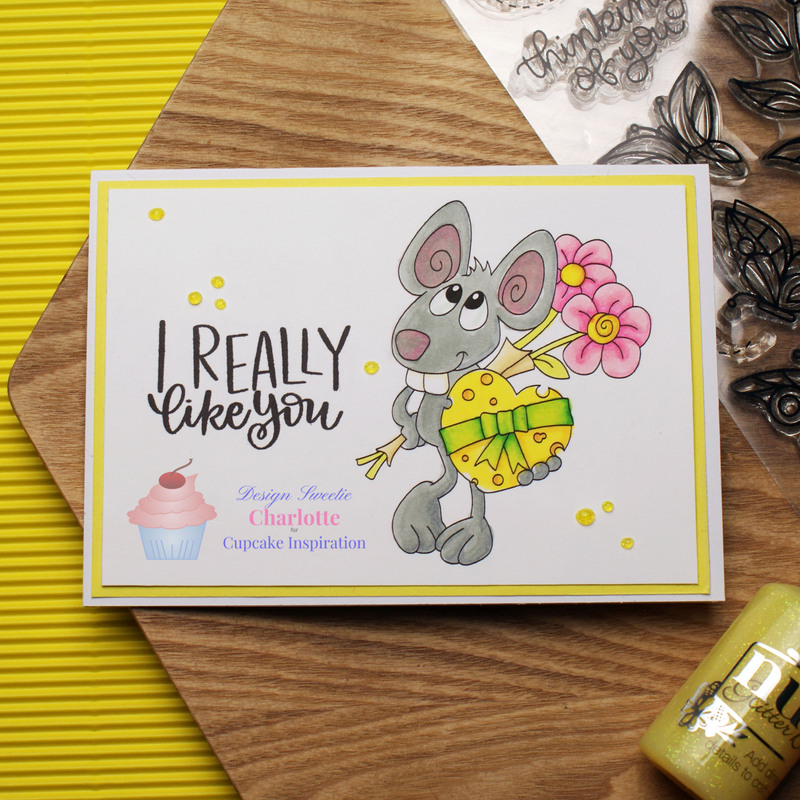 That’s so sweet, love that cheeky mouse and your wonderful colouring! Thanks for playing at Uniko, hope to see you joining in with future challenges too. Awww . . . how cute! 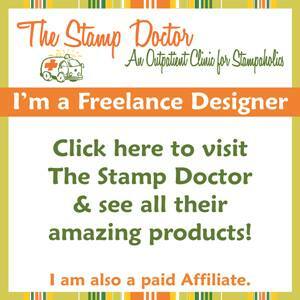 The simplicity of your card really lets this image shine! Thanks for playing with The House That Stamps Built. What a great image, he looks so coy!